Louis Jobst' arch and ball candleholders are little monuments to have in the home. The form derives from paintings by Jobst of monumental shapes and forms. 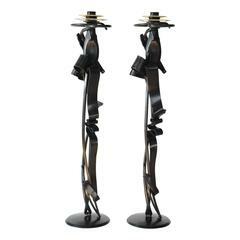 Each candle stick holder is handmade from mild steel and patinated black. The contemporary form works in any modern or classical space.